I finally caved and bought some special brushes for nail art and a dotting tool. 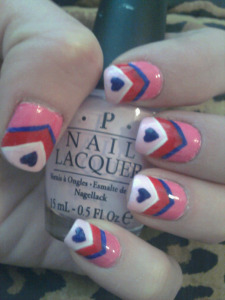 I created this design by hand, using a thin brush and home-made nail decals. 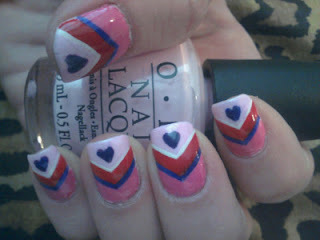 I made the heart nail decals by painting nail polish on a plastic sandwhich bag, letting them dry for a few hours, and then peeling them off. I applied them by painting a clear coat of polish on the nail, positioning the decal on the nail, lightly pressing it into the clear polish, and applying another coat of clear polish on top.